1st: 4-5-8-1-7…Bangle (4) gets Lasix for the first time after pressing the pace in career debut at Aqueduct. This one turned in a bullet work at Keeneland on May 23 and looks to be primed to roll again from the bell. My “dot” (must use), though, goes to Red Alert (5). Didn’t show much in his first out, but was hung wide throughout before giving up the dream. Trainer is good with second time starters and rider switch is a good one. I bet the 4-5 exacta box and play the 5 to win/place. 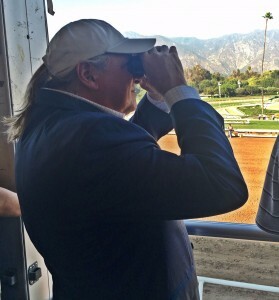 2nd: 5-1-3-7…Turn Back Time (5) gets my nod here for a trainer that knows how to win and hasn’t won all meet. May be time. Blinkers off is a good angle for this barn and it won’t take much to beat this field. Love Your Humor (1) is a dead closer and Calvin Borel knows how to hug the rail and come late. Azeg (3) ships in from Chicago and may offer some speed to the mix. I bet the 5 to win/place and wheel over/under the rest of the numbers. 3rd: 6-3-1-7…Tosha Talifero (6) drops in class and may be able to carry her speed farther today, too. Three back winner has been on fire and anything close to that race makes Tosha tough here. Run Away’s Sis (3) is another Richard-Lanerie team and figures to stalk the leader and have first run. Delusional KK is a Louisiana-bred and I question the pedigree, but drops back down in class after a win at Keeneland two back. Fits better here. I bet 6 to win/place and then box the 6-3-1 and the 6-3-7. 4th: 2-6-4-1-9…Bingo Kitten (2) is on his third race cycle and should be ready for a big effort. This dead closer picks up the meet’s top rider and has won at the distance. Although 0-for-3 on the CD grass, he has a second and a third. West Village (6) drops considerably in class and will enjoy a softer bunch. Has two wins in three career starts on this turf. Take note. I’m Ready to Roll (4) is another deep closer, but seems to always try. Picks up a HUGE jock change. Note here. Star Cross (1) comes off a win and moves up in class – which is always tough to do. But he is good right now. May be a reach here. I bet the 2 to win/place and then box the 2-6-4 in the exacta. I bet a smaller 2 exacta wheel over/under the numbers. 5th: 1-8-6-3-4-2…Nicholas and Me (1) is a first timer for a barn that does well right off the bench. Working well at both Keeneland and Churchill, so has brought his morning game with him. Off Road (8) has faced tough competition throughout his four race program to date. If he can get a clean trip, he may like the switch back to sprinting – for a barn that does well with turn backs. Mistake Present (6) sold for $335,000 as a yearling and obviously has a lot to do to make up for that price. He caught Cowboy Culture (a recent stakes winner at Arlington) and the super impressive Yoshida in his first two races – which meant he had no chance. Better spot here today. I bet the 1 to win/place and box the 1-8-6 in the exacta and then (note here), I wheel the 6 over/under in the exactas with the other numbers. 6th: 6-8-7-2-4…Sir Douglas (6) gets a tepid edge in a wide open race where one may be smart to hit the “all” button. Comes off three good efforts in a row and the three back winner can really run. The Gipper (8) moves up off a maiden-claiming win, but did so decisively and convincingly. Have to respect. Hold Me Back (7) had a huge win at The Fairgrounds and then switched to a turf sprint. No luck there and is back where he belongs. I bet the 6 to win/place and then wheel over/under all the rest. 7th: 6-1-2-7-5…Pontifical (6) goes for a solid barn that is really good at the second start off a layoff and switching from sprints to routes. Both are the case here. This one goes from 51/2 furlongs to 11/16 miles and Lanerie sticks. Interesting. Derby Champagne (1) is a true closer and has had some fun on the Churchill grass before. Is the one to beat. Dawn Raider (2) has done well since the switch in barns to Buff Bradley. I bet the 6 to win/place and then wheel over/under the numbers. 8th: 10-2-5-9-3-11…Tough Stuff (10) takes a huge drop for a barn that gets winners. Have to put on top. Safe Passage (2) ran well at this level in his last and a similar effort makes him tough again. My surprise “dot,” though, goes to Mo Bourbon (5), who is coming off a long layoff. Not known to crank them up after this long of a rest, but this trainer has this one training very well in the a.m. Was the favorite in first start at Saratoga last August and I’m taking a stand here. I bet the 5 to win/place and then wheeling him over/under the rest.